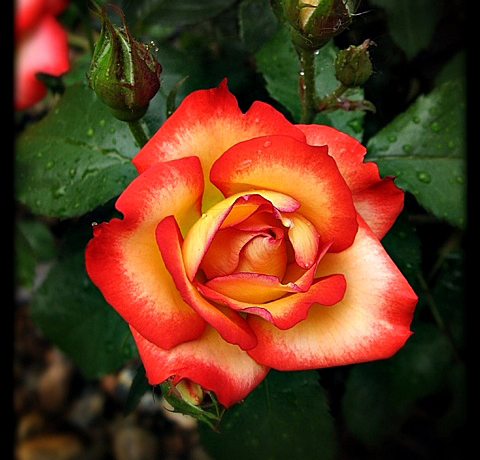 This is a great time of year to take a look at bare root rosebush care and planting. Many of us have either already received some bare root rosebushes or will within the next several weeks. When I first get my bare root roses I open up the packing box and check each one thoroughly. I take a good look at each rosebush from the tip of the canes to the bottom of each root. Broken or perhaps moldy looking root areas I prune off. Broken canes get pruned back to good healthy looking cane tissue. Many of the bare root rosebushes will be in fine shape and truly fine looking specimens. Some unfortunately will not. If we get bare root roses that have some beat up and badly broken canes or canes with splits or lesions upon them, or the roots are damaged in some way or covered with molds or funguses, we need to contact the customer service folks at the company we ordered them from and let them know. Many times the company really does not know what condition roses may have been shipped in. They do have standards, but when things get very busy trying to get the orders out the standards can slip. I have received bare root roses that were not packed correctly and thus were dry as an old bone out in the desert sun! Some of the roots snapped off as they were removed from the packing box. At times some roots will be damaged and it will not hurt the bush to just prune the damaged portion off. I like to have at least two five-gallon buckets of water ready when I inspect my new bare root rosebushes. One is for a quick dip rinse and the other is for soaking the bare root roses. In the soaking bucket I have lukewarm to cool water up to about two inches of the top of the bucket. I like to add a tablespoon or two of a product called Super Thrive to the soaking water as well as have a “tea bag” of the Haven Brand Moo Poo Tea soaking in there. Place the bare root rosebushes into the bucket and allow to soak for 24 to 48 hours. More than one such soaking bucket may be needed so as not to overcrowd the rosebushes. The soaking is very important to allow the root system to soak up plenty of water to get them well hydrated and thus ready for optimum performance once planted in their new homes. Submerging the union area of the canes partially or totally will not hurt a thing and can help their moisture level as well. Once they have been nicely soaked it is time to plant them. No matter where you live, cold climate or warm climate, I still recommend planting the rosebushes with the union area of the canes at least two inches below what will be the final grade line around the rosebushes. In cold climates this helps protect them from temperature fluxuations during the winter season. In warmer climates this will give the bushes a solid base so that they are not as easily whipped about by the wind. Wind rocking can do some real damage to the root system of rosebushes, not to mention the total uprooting in strong sustained winds. If planted when the temperatures may still dip down very low, mound the planting soil up onto the canes or place a wall-o-water unit around/over them for protection until the weather evens out. Once planted, I prune two to three inches off the canes, and seal the ends with either Elmer’s white multipurpose glue or Tacky Glue from a hobby/craft store. Then the fun part begins: waiting for the rosebushes to send out their new growth, leading to those beautiful bloom smiles! 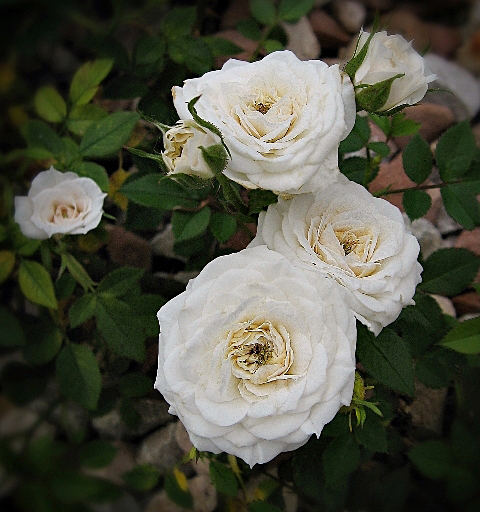 Author bio: With 40+ years of rose growing experience, Stan V. Griep is a Consulting Rosarian for the Rocky Mountain Region of the American Rose Society as well as the Denver and Loveland Rose Societies, a Colorado Native Rosarian, and is a member of the American Rose Society, The Denver Rose Society, and the Loveland Rose Society. 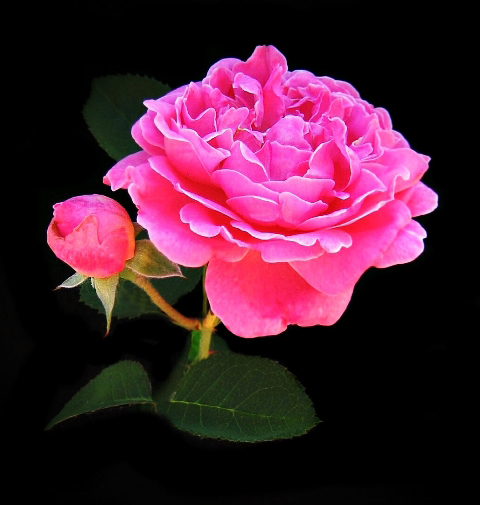 He is a “Cyber Consulting Rosarian” for the American Rose Society, Colorado Gardening on-line and GardeningKnowHow.com as well as a free-lance writer and speaker. An award winning photographer, his latest book is available at Blurb.com: http://www.blurb.com/b/6909245-heavenly-gifts-for-the-soul .